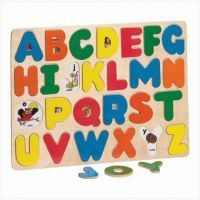 The Alphabet Jigsaw Puzzle encourages children to develop their letter recognition skills by putting colorful letters in their correct place. Each vivid letter displays an associated picture that reinforces memory. Matching the wood shapes assists toddlers in learning their ABCs while having fun playing an entertaining jigsaw puzzle game! Ages 3+.